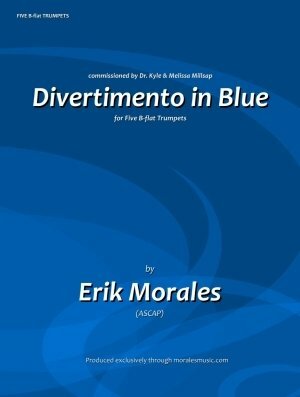 This new addition to my works for five trumpets, “Divertimento in Blue” was composed in 2017 at the request of Dr. Kyle Millsap for the Texas A&M University, Kingsville trumpet studio. The premiere performance of the piece took place at the 2018 National Trumpet Competition which was held on the campus of the University of North Texas, Denton, Texas. Dr. Millsap requested I compose a jazzy work that would be suitable for competition. Jazz pieces (that employ swing rhythms) are not usually heard in the realm of competitive trumpet repertoire. Therefore my challenge was to create a work that can maintain a satisfactory number of technical elements to keep it competitive. “Divertimento in Blue” meets those requirements, and more, but still speaks the unmistakable language of Jazz. An optional E-flat Trumpet part is included as an alternate to the B-flat Trumpet 1 part.